Everybody hates sticky body lotion. Because who wants to wait 10 minutes before you can finally put on a jeans or legging or, like me, want to jump in your bed after a warm shower. I never use body lotion because I always shower in the evening just before I go to bed. And I just don’t have the patience to wait till my legs are dry of body lotion. I just want to jump into my bed immediately. Two weeks ago I saw my legs and thought, well this time I have to nourish my legs because they look a bit dry. 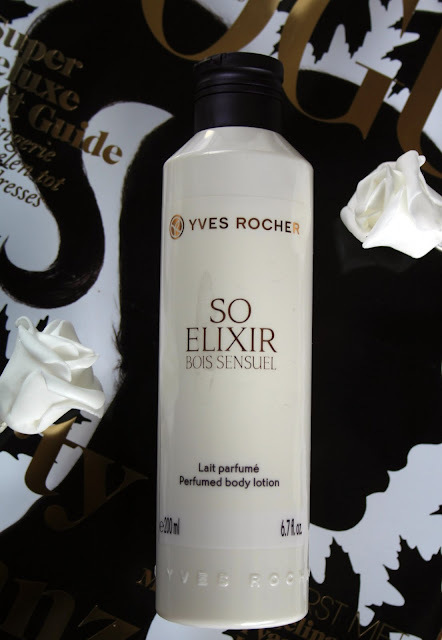 And against my will I opened my drawer with only-used-once body lotions and grabbed this Yves Rocher So Elixer perfumed body lotion. I got it when I purchased something else and I had never used it. I hadn’t even smelled it. Then I opened the bottle and smelled it for the first time and it’s an overwhelming but lovely smell. This makes me think of beautiful pink and white flowers. It makes me happy. And then I had to apply the lotion on my skin. Against my will I did it and while I rubbed it in, it was drying on my legs. Seconds later my legs felt like they never had lotion on it. Because I’m used to sticky legs I put even more on my legs to make sure that I did enough lotion on my legs. But it still was gone so quickly. For the first time in my life - I think - I’ve applied more than once a week a body lotion on my body. My skin feels super soft after i've applied it. I have it on my hands right now, (I had to smell it good and smelling my legs is a bit harder than the back of my hand) and my hands feel so soft and silky. This body lotion is seriously my favourite body lotion for now. I say for now, because I can have an obsession about one product for a while and then suddenly I find something else and that will become my new favourite. So it’s always temporary but it is my obsession right now!